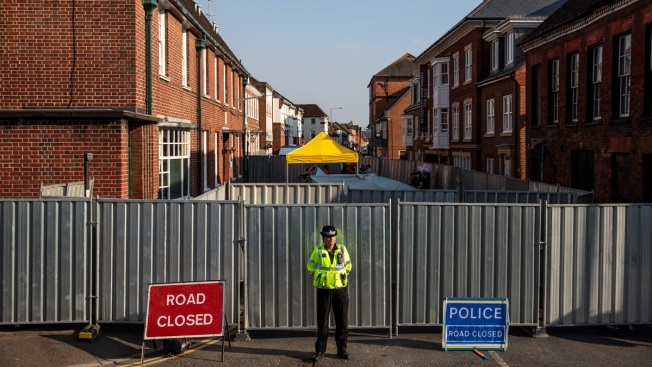 In this July 5, 2018, file photo, a police officer stands at a cordon around a supported housing project in Salisbury after a major incident was declared when a man and woman were exposed to the Novichok nerve agent in Salisbury, England. British police closed roads and called a hazardous response team Sunday night after two people became ill at a restaurant in the English city where a Russian ex-spy and his daughter were poisoned with a chemical nerve agent. Wiltshire Police described the emergency steps taken in response to "a medical incident" in Salisbury as "highly precautionary." "We can now confirm that there is nothing to suggest that Novichok is the substance," Wiltshire police said in a statement. The city spent months with quarantine tents and investigators in full-body protective gear combing for evidence after Sergei Skripal and his adult daughter were found unconscious on a bench in March. 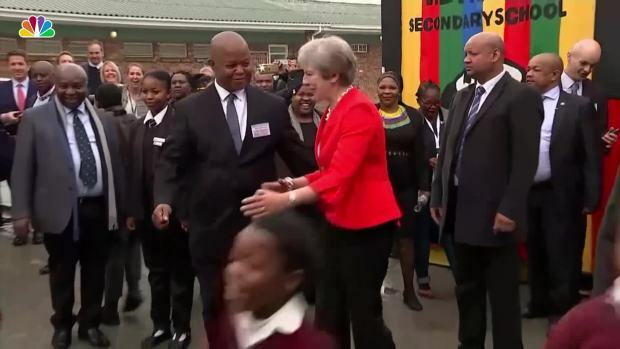 British Prime Minister Theresa May was captured on camera dancing two times while visiting African nations this week. Its residents were put back on edge in June when a man and a woman living in a nearby town was hospitalized with signs of exposure to the same Soviet-made nerve agent, Novichok. The woman, 44-year-old Dawn Sturgess, died. Britain's counter-terrorism police said this month they think Sturgess' boyfriend found a counterfeit perfume bottle containing remnants of the substance originally applied on the front door of Skripals home in Salisbury. The two people who became unwell at the Prezzo restaurant, a man aged in his 40s and a woman in her 30s, remain in the hospital for observation. At this stage it is not yet clear if a crime has been committed and an investigation is ongoing. "A cordon will remain in place around Prezzo at this time as part of ongoing routine enquiries. All other areas that were cordoned off will now be reopened," Wiltshire police said. British prosecutors have charged two Russian men in absentia with poisoning Sergei Skripal and his daughter, Yulia. They have alleged Alexander Petrov and Ruslan Boshirov were Russian intelligence agents, which they and Moscow have denied. 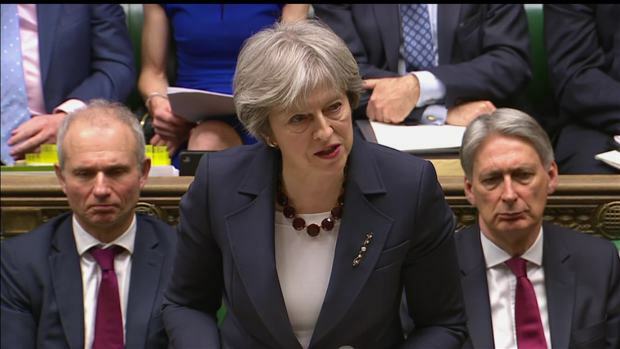 Britain announced on Wednesday it will expel 23 Russian diplomats, the biggest such expulsion since the Cold War, and break off high-level contacts with the Kremlin over the nerve-agent attack on a former spy and his daughter in an English town. Prime Minister Theresa May told lawmakers that the 23 diplomats, who have been identified as undeclared intelligence officers, have a week to leave.